Thank you for visiting my second page. 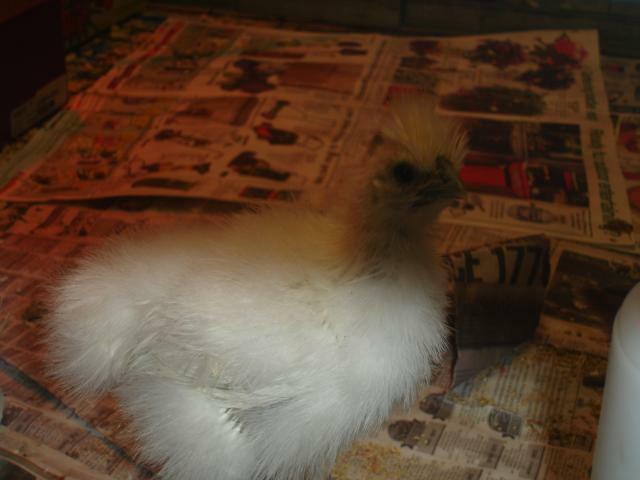 First, I would like to talk about tips on how to raise chickens before they go out in the coop. 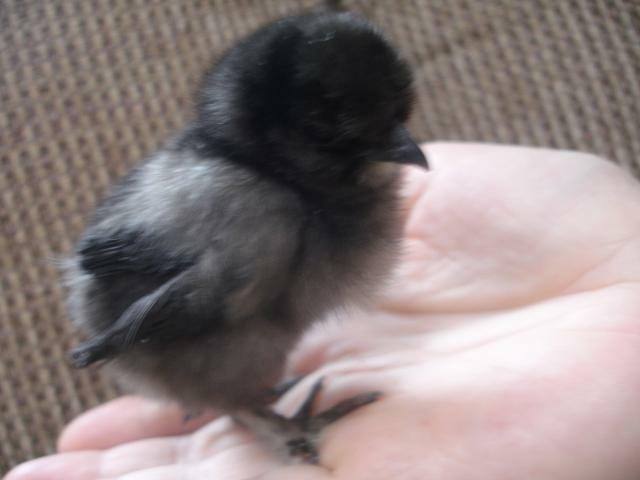 If you buy chickens as newly hatched chicks, you should make sure you feed them medicated chick starter for the first month or so. After that, you can use normal chicken feed, then move up to pellets when your girls are big enough to lay. DO NOT USE ONLY CHICKEN SCRATCH!!! It doesn't give them any nutrition, Its like candy. 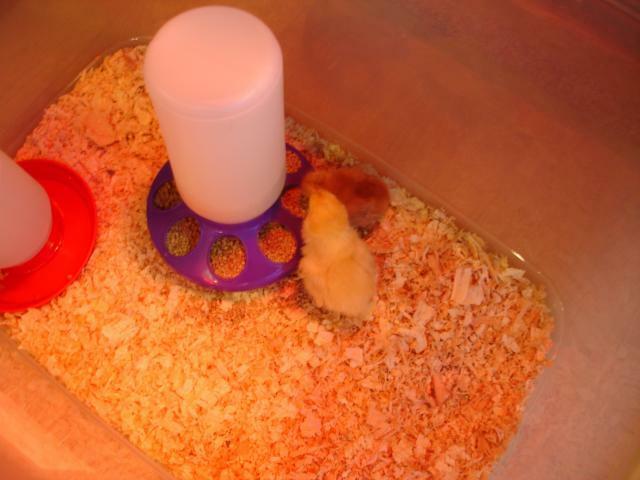 From the day they are hatched, baby chicks need an environment (mine was a rubbermaid tub) with certain heat temperatures. Starting at 90 degrees, the temperature should drop 5 degrees every week. 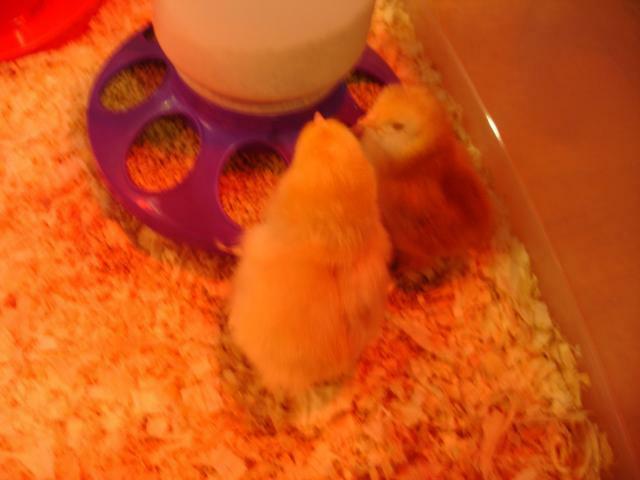 For example, when the chicks turn one week old, the temperature should be at 85. You can do this by moving the heating lamp further away from the cage every week (you can use a thermometer to tell the temperature.) For the bottom of the cage, I would recommend buying wood shavings from a feed store near you. (I used cedar shavings, but any kind should work) And, last but not least, You should clean out the cage and change the food and water once a day. I cleaned the tub by emptying it, scrubbing the sides with dish soap, and rinsing it with hose water, which was pretty simple. Then I put in new shavings. When your chicks start to grow too big for their tub (or when they're about a month old) I would recommend moving them into your garage. I put my chickens in a rabbit cage (that my neighbor donated) and layed down newspaper inside. I also gave them a few cardboard boxes filled with wood shavings (they liked to sleep in them) and, of course, I put their food and water inside. I also hang a small roost, just in case. For safety reasons, I hung their heating lamp above one corner of there cage, but they didn't seem to use it much. 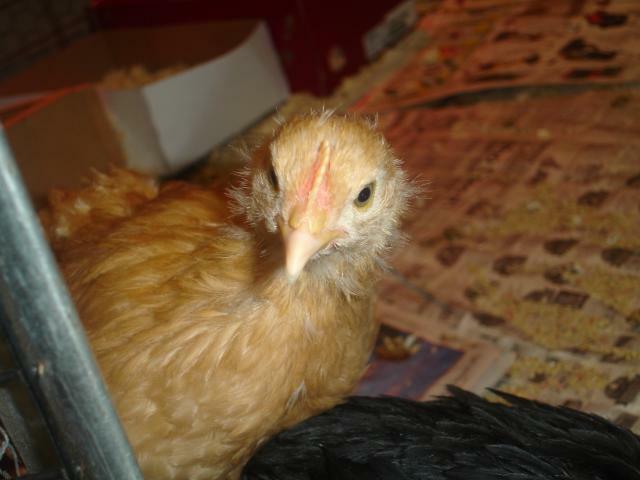 When our chickens were about 3-4 months old, we moved them out to the coop. However, your chickens might have to go out earlier or later that that. Its smart to just play it by ear. Unfortunately, I didn't build the coop, my dad did, so I can't give you tips on that. 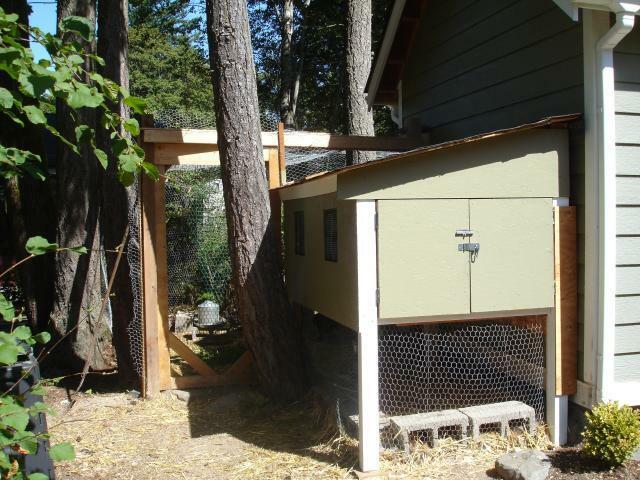 But I can show you some pictures of our coop. We put a large fence around and over the top of the coop to protect our chickens from predators. We also lock the chickens away in the coop every night, just to be safe. Every day, we make sure to give our chickens lots of fresh fruit and vegetables from our garden. They love eating fresh food, and it keeps them happy and healthy. We also let them run around the yard every day. 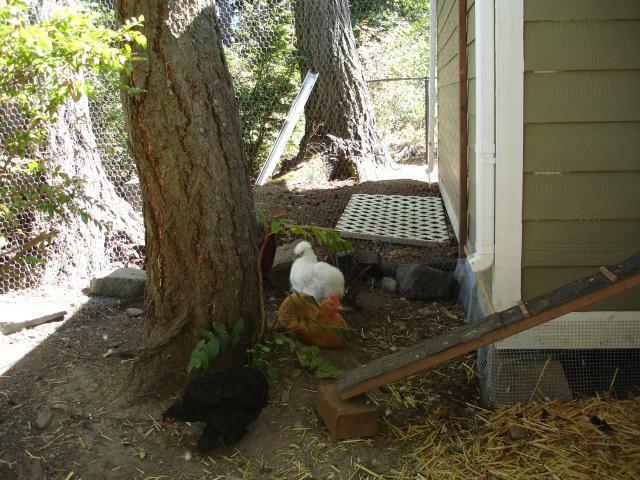 Surprisingly, they stay close to the coop, and its easy to round them up when its time to put them back. Never let your chickens out if your not comftorable doing it. Thank you for reading my page. I hope you enjoyed it!! !